Yes, you heard me, an Agent Carter dance number. We’ve known that it was coming for a while now, but before you inevitably watch it again on TV tonight, you can see Peggy and the gang dance their socks off right now. Entertainment Weekly revealed the lavish number, a scene inside the mind of a dreaming Peggy Carter, who apparently dreams in showtunes. Hopefully exclusively, because that would be amazing. Featuring not just the singing and dancing talents of Hayley Atwell, Lyndsy Fonseca (briefly reprising her role as waitress/aspiring actor Angie from season one), Bridget Regan, and even Enver Gjokaj, but the professional dance team of Dancing with the Stars, the whole thing is delightfully extravagant. It’s the sort of thing you’d have expect to get pitched as a final resort, a last hurrah for a show before it might get cancelled for good. It’s that level of fanservice-y craziness. Let’s hope that’s not the case for Agent Carter, and they just happened to decided to put on a jolly good song and dance. You can see it all again in tonight’s two-hour bundle of Agent Carter episodes on ABC. 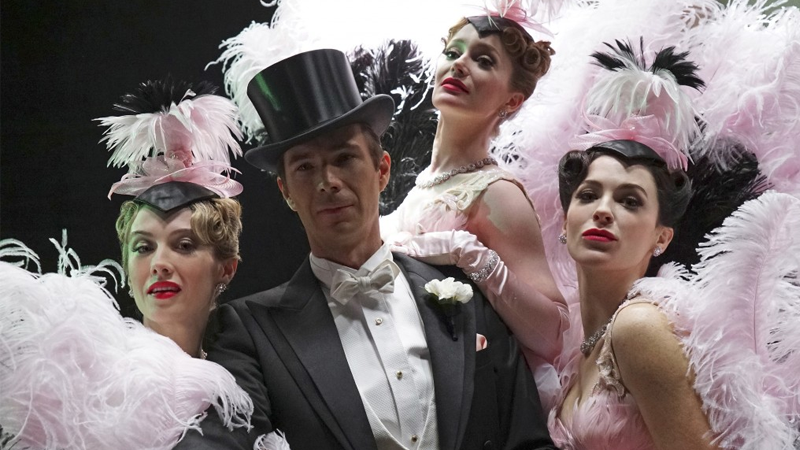 Header Image: Edwin Jarvis and his dancing gals, via TV Insider. Marvel/ABC.